The enforcement of overly punitive laws for drug offences has not only proven ineffective in curbing the production, trafficking, and consumption of illicit substances, but had many negative consequences, including overloading criminal justice systems, overwhelming the courts, fuelling prison overcrowding and exacerbating health problems. Focusing already limited resources on low-level offenders and drug users has prevented governments from targeting the perpetrators of organised crime who benefit from, and fuel for their financial benefit, the drug addictions of usually poor and marginalised users. This submission focuses on the human rights impact of current drug policies in the criminal justice system. 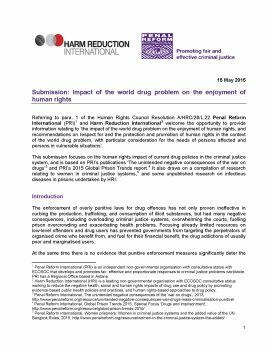 It is a joint submission by PRI and Harm Reduction International for input into the forthcoming report of Office of the High Commissioner on Human Rights (OHCHR) to the Human Rights Council in September 2015 in preparation for a special session of the UN General Assembly on the world drug problem (UNGASS) next year.